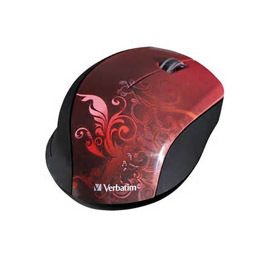 Verbatim Wireless Desktop Optical Design Mice Point and click in style with the Wireless Optical Design Mouse from Verbatim. The mouse features fun, colorful designs sure to catch attention with rubberized side grips made for comfort and control. Great for everyday or on-the-go use, the small Nano receiver plugs into your laptop‹¨«s USB port and can stay; no need to plug and unplug a bulky receiver or deal with cords! Key Specifications: Stylish Design‹¨«Colorful artistic designs and a unique easy grip shape.Nano Receiver & Nano Slide--Small enough to plug in once and leave connected, includes a storage place to slide nano receiver into base when needed.Wireless-- Plug in nano receiver and go wireless, 2.4GHz reliability and performance.